The Hieromartyr Clement was born in the Galatian city of Ancyra in the year 258, of a pagan father and a Christian mother. He lost his father when he was an infant, and his mother when he was twelve. She predicted a martyr's death for him because of his belief in Christ. A woman named Sophia adopted him and raised him in the fear of God. During a terrible famine in Galatia several pagans turned out their own children, not having the means to feed them. Sophia took in these unfortunates, and fed and clothed them. St Clement assisted her in this. He taught the children and prepared them for Baptism. Many of them died as martyrs for Christ. St Clement was made a reader, and later a deacon. When he was eighteen he was ordained to the holy priesthood, and at age twenty he was consecrated Bishop of Ancyra. Soon afterwards the persecution against Christians under Diocletian (284-305) broke out. Bishop Clement was denounced as a Christian and arrested. Dometian, the governor of Galatia, tried to make the saint worship the pagan gods, but St Clement firmly confessed his faith and valiantly withstood all the tortures. They suspended him on a tree, and raked his body with sharp iron instruments so that his entrails could be seen. They smashed his mouth with stones, and they turned him on a wheel and burned him over a low fire. The Lord preserved His sufferer and healed his lacerated body. Then Dometian sent the saint to Rome to the emperor Diocletian himself, with a report that Bishop Clement had been fiercely tortured, but had proven unyielding. Diocletian, seeing the martyr completely healthy, did not believe the report and subjected him to even crueler tortures, and then had him locked up in prison. Many of the pagans, seeing the bravery of the saint and the miraculous healing of his wounds, believed in Christ. People flocked to St Clement in prison for guidance, healing and Baptism, so that the prison was literally transformed into a church. When word of this reached the emperor, many of these new Christians were executed. Diocletian, struck by the amazing endurance of St Clement, sent him to Nicomedia to his co-emperor Maximian. On the ship, the saint was joined by his disciple Agathangelus, who had avoided being executed with the other confessors, and who now wanted to suffer and die for Christ with Bishop Clement. The emperor Maximian in turn sent Sts Clement and Agathangelus to the governor Agrippina, who subjected them to such inhuman torments, that even the pagan on-lookers felt pity for the martyrs and they began to pelt the torturers with stones. Having been set free, the saints healed an inhabitant of the city through the laying on of hands and they baptized and instructed people, thronging to them in multitudes. Arrested again on orders of Maximian, they were sent home to Ancyra, where the ruler Cyrenius had them tortured. Then they were sent to the city of Amasea to the proconsul Dometius, known for his great cruelty. In Amasea, the martyrs were thrown into hot lime. They spent a whole day in it and remained unharmed. They flayed them, beat them with iron rods, set them on red-hot beds, and poured sulfur on their bodies. All this failed to harm the saints, and they were sent to Tarsus for new tortures. In the wilderness along the way St Clement had a revelation that he would suffer a total of twenty-eight years for Christ. Then having endured a multitude of tortures, the saints were locked up in prison. St Agathangelus was beheaded with the sword on November 5. 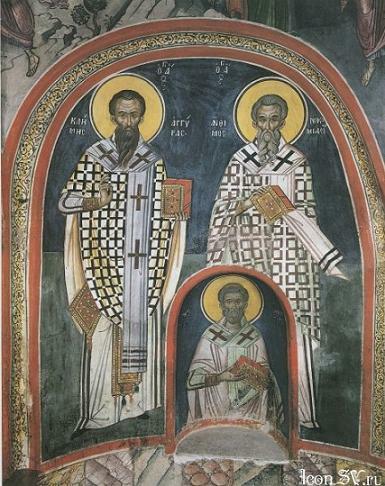 The Christians of Ancyra freed St Clement from prison and took him to a cave church. There, after celebrating Liturgy, the saint announced to the faithful the impending end of the persecution and his own martyrdom. On January 23, the holy hierarch was killed by soldiers from the city, who stormed the church. The saint was beheaded as he stood before the altar and offered the Bloodless Sacrifice. Two deacons, Christopher and Chariton, were beheaded with him, but no one else was harmed. and as a most sweet fruit given by God to the faithful. intercede with Christ God that our souls may be saved. "Christ is the shining joy of martyrs."